The "sand" section of Manhattan Beach gets it's name from the proximity to the beach. The area stretches from Hermosa Beach to the edge of Manhattan known as El Porto. In this wonderful area you're never far from the beach, often walking distance to shops, restaurants and bars, enjoy almost perfect weather, are treated to spectacular sunsets, and often have great ocean views. Gone are most of the original beach bungalows and most have been replaced by larger homes. Some of the unique areas are the "walkstreets" in which the homes front a pedestrian only "street" which allows for less noise, no cars, and a much safer atmosphere and the lack of cars make views that much more impressive. El Porto, the most northern area of the sand section, is the most affordable as many of the typical 30x90 foot lots were split and the smaller lots equal smaller homes equal smaller price tags. Without question the most sought after property in the sand section are the very rare and always impressive homes located beach front on "The Strand" These homes offer the high end luxury buyer endless and unblockable ocean views. Manhattan Beach is a city that has it all and is an absolutely ideal place to live and work. From the nearly 365 sun filled days to it's proximity to endless activities, Manhattan Beach has it all. Manhattan Beach offers housing options from multi-million dollar mansions on the world famous "Strand" to wonderful cottages on tree lined streets. Manhattan Beach real estate is generally comprised of 5 very distinct "sections". 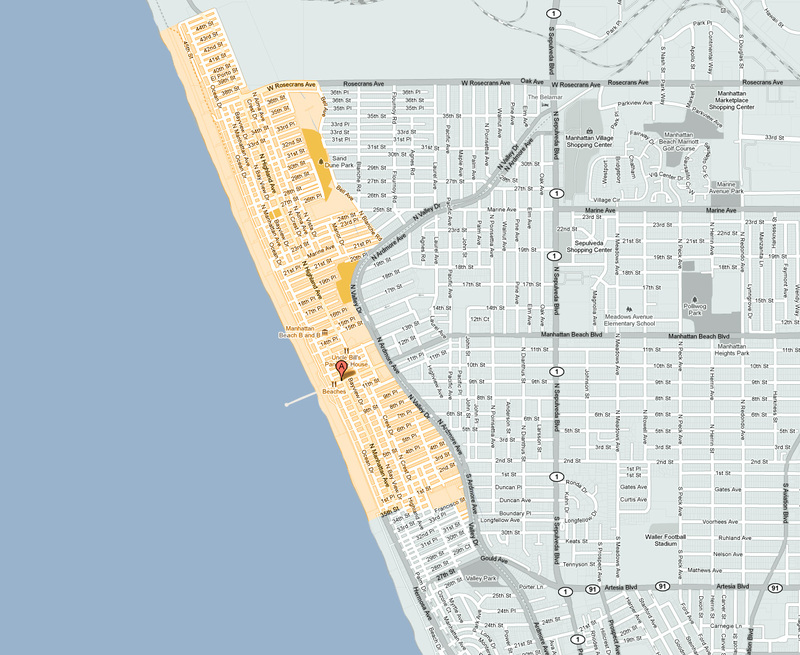 All of these neighborhoods are part of the award winning Manhattan Beach Unified School District but each has a very different atmosphere that appeals to people with varying priorities. The sections are the Sand Section with many charming pedestrian only streets and the ever important proximity to the beach, the Tree Section with great family neighborhoods and tree lined streets, the Hill Section with breathtaking ocean views and breezes, the gated community of Manhattan Village, and the area east of Sepulveda Blvd known as East Manhattan.